But on an unseasonably cold afternoon recently, Ms. Johnson’s thoughts were on matters she found more pressing than national politics — namely extracting her toddler son from the indoor playground at a Chick-fil-A so she could get on with her day. Asked whether she planned to vote in the upcoming midterm elections, Ms. Johnson was ambivalent. She said she doubted that any candidate in either political party would make much of a difference in her life now. In interviews with two dozen people who live in a pair of Republican-held swing districts that stretch across 160 miles of the American heartland — through the urban sprawl of Omaha, past the wind farms and corn fields of western Iowa, and eastward into the Des Moines metropolis — the spasms of the national news cycle were often back-of-mind distractions, especially among the less partisan women who are crucial to Democrats’ hopes of winning back the House of Representatives. The concerns they described were personal, everyday issues that had only a tenuous attachment to President Trump — despite the efforts of Republicans, Democrats and the president himself to make the midterm elections a referendum on his popularity. Betsy Rubiner, a Des Moines freelance writer, has been canvassing and making calls to undecided voters every week as a volunteer for Cindy Axne, the Democratic challenger for the Iowa seat currently held by Representative David Young, a second-term Republican. Ms. Rubiner said Mr. Trump’s presidency has scared her into activism. “I feel terror, and that’s not overstating it,” she said. But the lack of engagement she finds from prospective voters on the issues that dominate cable news, she added, has been striking. Her canvassing partner, Martha Gelhaus, a retired state worker, nodded in agreement. She is still surprised, she said, “by how much people don’t know” about national politics, and described how she doesn’t broach the subject of Mr. Trump as a motivational tool when she talks to potential voters. “I don’t use that,” she insisted. The dynamics in Nebraska’s Second District and Iowa’s Third, just across the Missouri River from each other, are a microcosm of the dueling forces at work in many of the congressional races across the country that will be hardest for Democrats to flip. They are places where the liberal-heavy urban or suburban cores may not turn out in great enough numbers to outweigh the reliably conservative voters further out. Still, they remain appealing potential pickup opportunities for the Democrats because of their history of voting for both parties. Nebraska’s Second District went for Mr. Obama in 2008, but not in 2012; Mr. Obama carried Iowa’s Third both times. Both districts feature Republican incumbents facing Democratic women who have the help of a coalition of progressive groups like Emily’s List, Planned Parenthood, Naral and the Human Rights Campaign, which have tried to harness the surge of female activism since Mr. Trump’s election. Despite the similarities, the Democratic candidates have presented very different profiles to their districts. 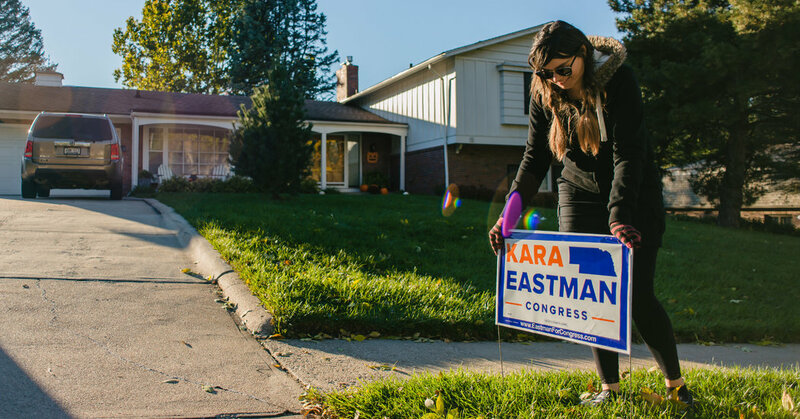 In Nebraska, Kara Eastman is running on a Bernie Sanders-style platform of “Medicare for All” and free community college. She regularly tweets about her disgust with the president. In Iowa, Ms. Axne tends to avoid talking about Mr. Trump. She has tried to keep her focus on expanding access to affordable health care and covering pre-existing conditions, positions that are not as easy for her opponent to attack as radical and socialist. In polls she has dropped behind her Republican opponent, Don Bacon, who has framed the race as “results versus resistance,” trying to link Ms. Eastman to the Trump opposition movement. Ms. Eastman has said she does not identify as a democratic socialist. In an interview, she said she opposed impeachment for Mr. Trump and did not look down on Trump supporters, who include her in-laws. In Iowa, where Ms. Axne is tied with Mr. Young in recent polls, she most often talks about her business background as the proprietor of a digital design firm she runs with her husband, and of her former job in state government where she learned how to cut bureaucratic inefficiency. Both Republican incumbents have managed the delicate balancing act of criticizing the president’s style while praising him on substance, with little apparent damage to their reputations among the Trump faithful. “Hey, I wish the president was a little more Iowa than New York,” Mr. Young said at a recent campaign stop. Mr. Bacon has said he thinks Mr. Trump “could raise the bar” with his behavior. “I haven’t talked much about the mob,” he said in an interview, referring to Mr. Trump’s portrayal of the Democrats as angry and unhinged. At the Omaha Chick-fil-A, Ms. Johnson sat with two friends — another independent-leaning woman like her who said she was disillusioned with both political parties, and a self-described democratic socialist who planned to vote for Ms. Eastman. Ms. Johnson described being both hyperaware of the politics around her but not inspired enough by anyone in either party to get more engaged. Ms. Johnson weighed the value of voting in the midterms, asking whether it was just part of an endless cycle of disappointment with both political parties. “But isn’t that a cop-out?” she asked. “I’m my own worst devil’s advocate.” Still, she seemed unlikely to vote. Democrats always understood that mobilizing women would be essential to retaking the swing districts that could give them a majority in the House. And, as voters in Iowa and Nebraska make clear, no single approach will work. Rachel Hadaway, a software tester in Des Moines, stopped by a state Democratic Party event the other night with a specific purpose: to gather information she could use to convince unmotivated friends to vote for Ms. Axne. As she listened to the speakers, Ms. Hadaway jotted down the things she liked about Ms. Axne that she hoped would be persuasive. She supports a fairer tax code, Ms. Hadaway noted, and has vowed not take corporate donations. “I think there’s a lot of people, they have other things going on,” she said, explaining why many people she knows are not enthusiastic about voting. Her message to her friends, however, might not be one that thrills most Democrats. Unemployment Looks Like 2000 Again. But Wage Growth Doesn’t.